Hope to maintain dignity, live to the fullest, be free from pain and spend valuable time with loved ones wherever they call home. This is the hope that Hospice of the Upstate provides as we serve terminally ill people of all ages, with all types of progressive diseases—from heart, lung, kidney, vascular and neurological diseases to AIDS and Alzheimer’s. As a not-for-profit, community-based organization with a 31 bed in-patient facility, our vast array of services allow us to stand out from other hospices. Hospice of the Upstate has been caring for terminally ill patients and their families since 1988. Our first priority is to provide the highest quality end-of-life care and to do that regardless of ability to pay. We were founded by community leaders to serve a community need. Today, Hospice of the Upstate serves over 1000 families each year in Upstate South Carolina through our homecare program and at the Rainey Hospice House. 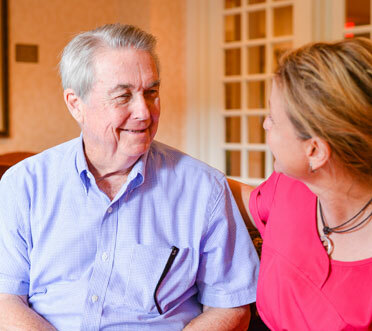 Hospice of the Upstate provides compassionate, quality care to terminally ill patients and their families, while offering leadership and community education for end of life. Hospice emphasizes palliative rather than curative treatment, choosing quality rather than quantity of life. Support is offered through a personalized plan of care to ease the many different types of pain facing patients and families during such a difficult period of time. Under a personalized plan of care, our professional team provides medicines, medical equipment, and education for families, as well as help with managing pain and other symptoms. Our aides also assist with personal hygiene and light housekeeping. Social workers support the family in problem resolution and planning, and our bereavement counselor provides family grief counseling. Trained volunteers provide emotional support, take care of errands, and allow caregivers some much needed time for themselves. Emotional, spiritual and practical support is given based upon the patient’s family needs. Because our patients and their families come first, we are committed to providing excellent care. Spending quality time with patients will always be a priority. We will preserve the spirit of compassionate care, which is our foundation, in the face of change. Integrity will continue to guide our actions. We care about our staff; their health, happiness, development and their future. We are committed to a free and open exchange of ideas in a culture of trust. We will be good stewards of our resources while striving to fulfille our mission. We are rooted in our community as a resource, and we value our responsibility to give back to those around us. During the fall of 1987, a small group of visionary leaders began work on starting a hospice program for our community. Having experienced the whole-person care given to family members in hospice elsewhere, they spoke with physicians, clergy, and anyone else who would listen to decide how to proceed. Following is a summary of the milestones that moved their dream into reality. Hospice of Anderson founded as a non-profit for the benefit of the community. First Remembrance Service held in celebration of the lives of loved ones. Long range plans for a Hospice House begin. Name changed to Hospice of the Upstate, Inc. to better reflect our coverage area. 1st annual Camp Sunburst children’s bereavement camp was held in the spring. Hospice Medicaid Benefit was initiated in South Carolina. The Callie & John Rainey Hospice House was completed. On July 26, the first patient was admitted. The Rainey Hospice House Palmetto Wing was completed, bringing our total patient capacity to 32. Volunteers from faith communities joined Hospice of the Upstate to form “Faith in Action,” which helps spread the word about what hospice care is and the opportunities for volunteering at Hospice of the Upstate. Rose Dining Hall completed, providing for meals and family gathering space. The “Wall of Continuing Life” is installed in the Rainey Hospice House – a woodland scene that grows over time as families add flowers, animals, and birds to the mural. Friends of Hospice of the Upstate give the Rainey House Meditation Gardens and Barbara Craft Garden, which provide seasonal beauty and a relaxing environment. 20th Anniversary Celebration, celebrating care for over 1100 patients! CareAnyware implemented, with electronic medical records that provide a tool for quick response to patient needs. First “Wings of Hope” butterfly and dove release in May. Renewal at the Rainey House completed. Pet Peace of Mind grant provides financial help, volunteer care, and fostering families to care for patients’ pets. 25th Anniversary Celebration, including ribbon-cutting ceremony for the Renewal at the Rainey House.